storage rack that go over the toilet is a great idea. These space savers usually have two to three shelves. 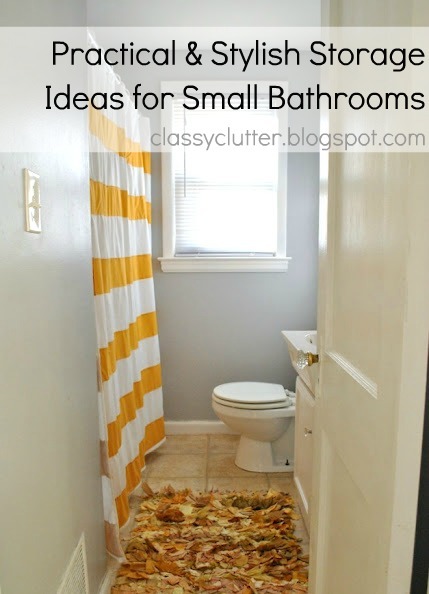 do not take away from any of the floor space, so this is great for a smaller bathroom. soap. This is a great way to save some space and make the bathroom look less cluttered. also thin it will not take up much space. There are many furniture pieces that look great yet are compact enough to fit into a small room. and the bathroom has more space and looks organized. Even though a person may not have their ideal bathroom, this is not a reason that it cannot look nice. is no need to desire more when the bathroom that a person has looks great and is stylish. Thanks Kyla for your great tips on storage space as this is always a battle in our home! What do you guys think? Is storage a battle in your home?